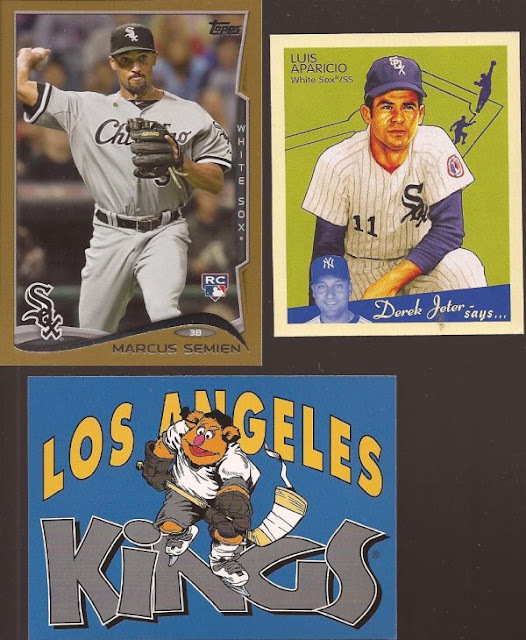 Growing up, I cannot remember getting any baseball cards in my Easter baskets. My mom never bought any cards for us. The basket was just chocolate eggs, jelly beans, Peeps, a Tootsie Roll bank and a kite. You HAD to get a kite on Easter or you were heartbroken. And it was always that kite with the sticker eyes and looked like a flying monster. String off the collar, pal. I ain't flying today. When you become a parent, you don't get a basket. You are just stealing candy from your children, or eating out of a 2nd bag of jelly beans you buy. And when your kids our out of the house, it's always the 2nd option. So since I didn't get a basket, I'm calling a few recent mailings my Easter basket. First up, substituting for jelly beans is a mailing from Jon as A Penny Sleeve For Your Thoughts. Jon sent a small mailing over for some pocket schedules (I think), but don't think of small as bad. You can do a lot with small. How about some small stickers? Jon dropped a nice groups of 1983 Topps stickers. I'm not sure what's special about the gold Bull in the top row. 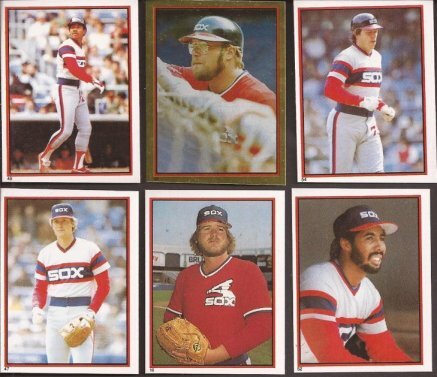 But nice grouping of players, with Fisk, Baines, Hoty, Cruz and Spanky along with Luzinski. I'll be honest - I'm crap shooting here. I scanned this, then screwed up my text file. I am pretty sure Jon sent these (along with other cards I didn't scan). If I'm wrong, yell at me. But remember when Pacific looked like the cards were designed by 12 year old kids, and not looking like the walls in a Vegas casino after a grenade went off? Great image on the Seaver, though. Great framing keeping the ball in the photo. Thanks, Jon. From what I know, Twitch is known well on Twitter, but just recently started his blog Twitch Collects Cards. What I know for sure - I got a new person the send cards too. And receive cards from as well. I also sent CC some pocket schedules and got a nice return package. Sad to see Alexei go, but we need to shake up the team, so it's time to rebuild. I've talked enough about Morel, but I will still accept cards of the man. Engel is highly talked about in the Sox system. He won the Arizona League MVP last year, so his star is rising. 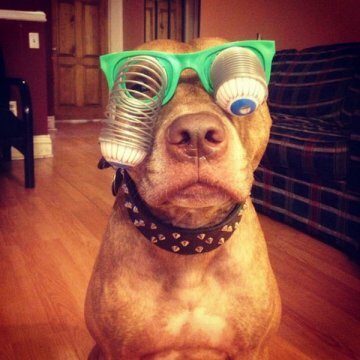 What the future holds is to be seen. Marcuz Semien gold. Aparacio mini Goudey. There - I got through them really quick because I am sure the first words out of your mouth was "What the hell is that Fozzy card?" Twitch included a pack of these Muppet NHL cards. I will get the rest of the pack up on APTBNL this week. Just realize that they are as cool as you can imagine. Thanks for the cards, Twitch. Last, but not least, is my Blackhawks OPC hookup, Jeremy, who you can find on Instagram at semi_pro_set. He makes for another fine dumping point for Red Wing cards (note to self: send Jeremy some Red Wing cards). And being in the Great White North, he sends me all the lovely O Pee Chee I can handle. 84/85 Savard? Check. 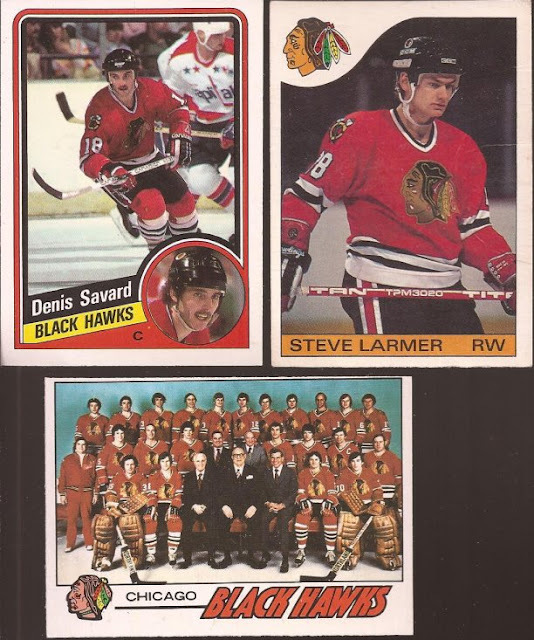 85/86 Larmer? Check. 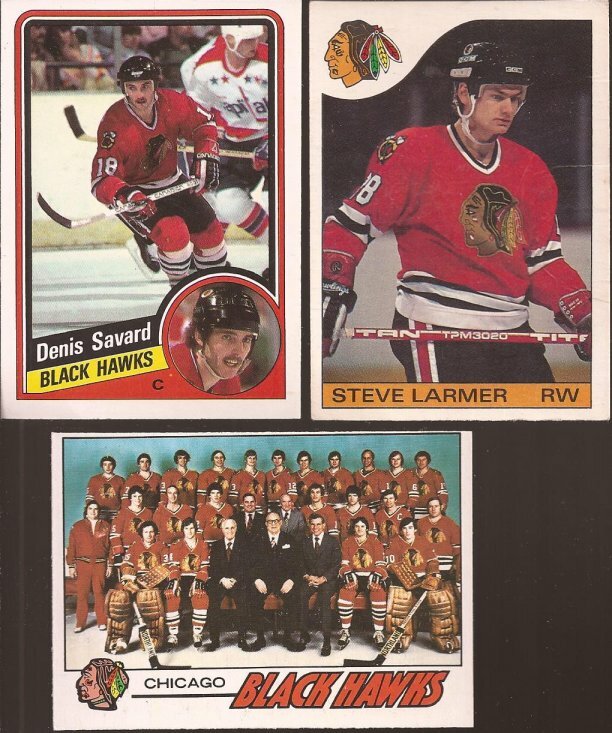 Gorgeous 77/78 Hawks team card? Triple check! Just knowing these are OPC seems to make them a little more special in my mind. Even when cards exploded, late 80's and early 90's O Pee Chee feel different. 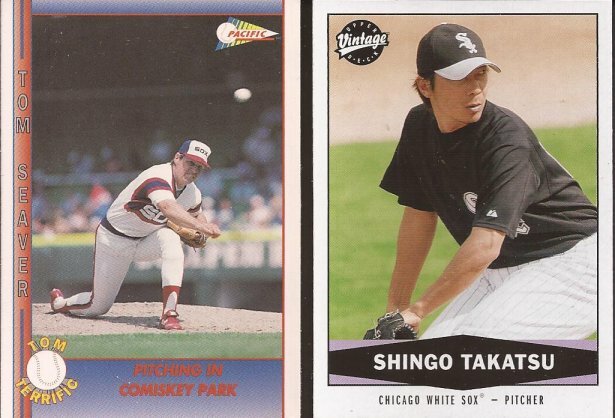 it's probably the fact that Topps held the set at 198 card while OPC would top out a baseball set sizes. Jocelyn's brother Claude has three Cup rings. Jocelyn was more a 4th line grinder in the league during his 13 seasons. Eddie's in the Hall, and Larms needs to be. He was a quiet winger that was nothing but consistent year after year. Vote him in. And thanks again, Jeremy. Ok - time to go see how much ham is left to nibble on. I'm glad to have found a loving home for the OPC. The very first cards I remember getting were 1960 cello packs in my Easter basket. I'm not positive but if my memory serves, the gold stickers went on the All-Star pages in the albums. the only kite I had as a kid was the "puffer" kite. first time up it flew right into a pointy tree limb and psssssssssssssssst, went flat.